Ever heard of the online dating website WealthyMatch.com created for wealthy men to find beautiful women who are seeking such men. Marketed as a dating platform where women who want to be spoiled can search for upscale men, so a relationship with “mutual benefits” can be created. But, is this for real or just another scam? Continue reading this review to find out what’s really hiding behind the classy exterior of WealthyMatch.com. In the end, we welcome you to share your questions about this website, or write about your personal experience while dating on WealthyMatch.com to help other see if it’s real or fraudulent. There are several factors that point towards the total illegitimacy of this online dating service. Basically, WealthyMatch.com baits naive people, scams them and rips them off without them noticing. Here, we will disclose what we found about the workings of WealthyMatch.com. Did you really think that there are desperate millionaires in the world who have trouble meeting gorgeous women in real life? If you were deceived to believe that any of those people you see on WealthyMatch.com were real, then you should learn that this website utilizes a program or service called Love Stars. This program includes fabricated profiles which are created by the company who owns WealthyMatch.com. They take photographs, descriptions, personal details and correspondence samples from real users and re-create them on other networks. Moreover, in the Terms and Conditions of use we found this paragraph that confirms our suspicions. Posting photographs, uploading personal information, customizing your profile or publishing anything in a public area of the site allows WealthyMatch.com to gain all legal rights of that content. WealthyMatch.com also has the legal rights to freely distribute your personal info to other websites, so you shouldn’t be surprised to see your photos and data posted on other dating sites that are owned by the same company. Your profile information can be re-worked, translated, mixed and matched with other people’s info, and even posted on other dating networks owned by other companies. Once you sign up and create your profile, you will start receiving many chats, email messages, different notifications, which are informing you that other members of WealthyMatch.com are interested in you. We got a lot of messages, but were blocked from opening, reading, or replying. That’s how we figured out what WealthyMatch.com is actually all about. Whenever you try to communicate with another site member, WealthyMatch.com you are taken to a payment page where you have to provide your credit card information and choose a subscription plan. So, unless you give them your money you don’t get to message or connect. As we said in the section above, if you see a millionaire you’d like to start a conversation with, you’d have to pay to be able to send them a message. And, when you get tons of messages in your inbox (from millionaires-so they say), you have to upgrade your membership to be able to read the content of the emails or to write back. 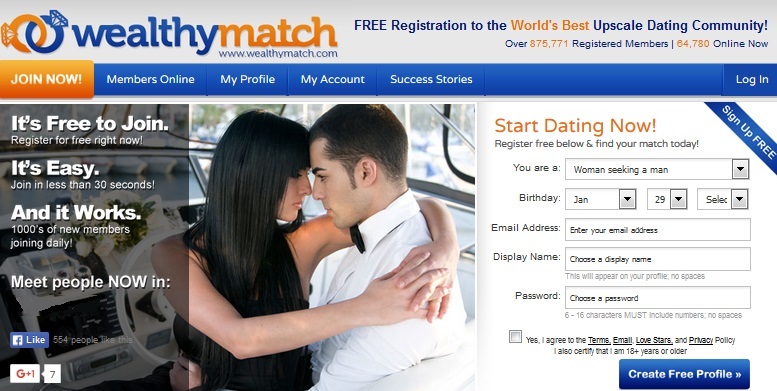 Now you know about the scamming truth of WealthyMatch.com. We caringly advise you to always read the terms and conditions of use before giving your credit card info to an online dating service. Dating websites tend to hide many important facts in this document. If we left something unanswered in this review, feel free to post your comments and questions in the section below. Also, you are welcome to share your personal experience if you have ever been a member of WealthyMatch.com and warn others before more people get ripped off. Contact the Better Business Bureau to file a complaint and report the site if you feel you have been conned and/or ripped off.